Author, speaker and financial planner, Sylvia Walker has written a new book about how women can gain financial independence and grow their wealth. 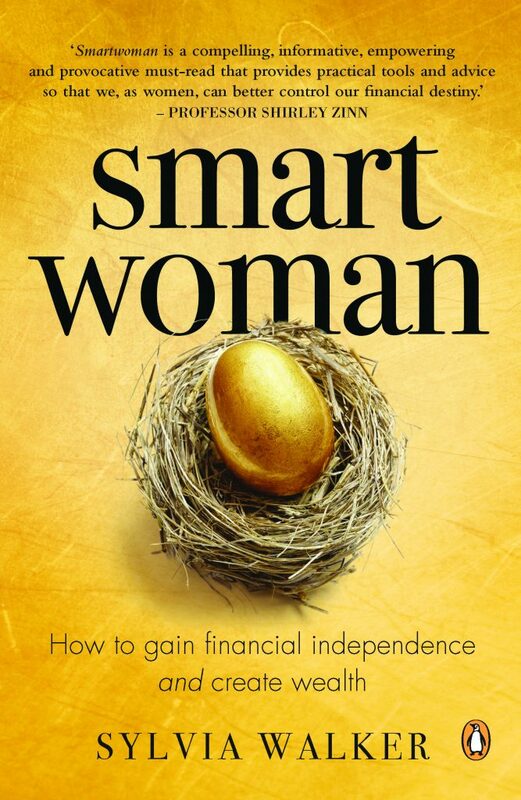 The book, titled Smartwoman, will be released this month under Penguin publishers. Walker says that the book aims to empower women to become financially savvy, irrespective of their marital status. Walker says that people have different approaches and attitudes towards money, referred to as one’s money personality. Here’s a book extract for you to enjoym published by Penguin. Your marital contract will determine how your assets are divided upon divorce. But, after years of marriage, not all ownership is clear-cut. Before you draw up an agreement, it is useful to make a list of all your assets, so that you can determine what belongs to whom. Bertus Preller, family law specialist and author of Everyone’s Guide to Divorce and Separation, recommends gathering a list of each spouse’s assets and liabili-ties, detailed monthly expenses, proof of each spouse’s earnings, bank or credit card statements, mortgage bond documents or title deeds, pension or provident fund statements, and copies of any short-term insurance con-tracts that would list the value of assets. Whichever preparation work you do yourself will save you money in the long run; this is obviously much easier to do if you are working together to reach an amicable agreement. But most divorces aren’t so easy. People may try to plead poverty or hide assets. They may undervalue their assets, set up a trust and transfer money into that, repay fake loans to family or friends, or fail to disclose bank accounts. I even heard, once, of a man who ploughed large amounts of cash into casino chips, as his divorce was pending. Once the dust had settled, he cashed them in again. I’m not sure if this story is true, as I don’t know enough about the casino world, but it certainly did strike me as ingenious! If assets are being hidden and you are battling to identify everything, a forensic accountant or an appraiser may be a good resource. Your financial adviser needs to be part of the process and the discussions every step of the way so that your financial interests, as well as your legal interests, are protected. If you are married in community of property, your retirement provision forms part of the communal assets, and one spouse could be entitled to a portion of the other spouse’s pension fund, provident fund, preservation fund or retirement annuity. That spouse’s share can be taken in cash. The recipient will then have to pay tax on this amount, or may transfer his or her share into a retirement annuity, preservation fund, pension fund or provident fund. It must be clearly stated in the divorce order that the spouse who is not the member of the fund is entitled to a pension interest, as defined in the Divorce Act. This ‘clean-break’ principle means that the funds will be paid out within 60 days, and the spouse who is the member of the pension or provident fund will have a significant drop in his or her retirement provision. creating with your husband, so you need to preserve it to continue growing this wealth. at divorce, you now have a serious shortfall in your retirement provision and need to ramp up your investments to make up for this loss. Your ex-husband could pass away. Your minor children would have a claim against his estate, but what if he had remarried and there were other minor children from his new marriage, or he had minor children from a previous marriage, resulting in all the children competing for the same pot of money? Your ex-husband could become disabled or lose his job, and become unable to earn an income. You can’t get blood out of a stone, so you would be pretty powerless if he stopped paying child support. A sudden loss of child support could be devastating for your financial situ-ation. Be proactive and suggest that your ex-husband takes out a policy that insures his life and provides funds at disability – and, perhaps, even retrenchment. This should form part of your divorce settlement: he pays the premiums, but the policy is yours. As it forms part of your divorce decree, it is an order of the court that he needs to pay the premium. But, if he doesn’t pay the premium in future, for whatever reason, you could always pay it and cover would continue – the policy is yours, so you have control. You will need financial as well as legal advice throughout the divorce process. The importance of financial advice at the time of divorce is often easily overlooked, with devastating effects later on. If the family home is being sold as part of the divorce agreement, use this to your advantage. It may be heartbreaking and stressful, as you’ll need to find a new place to live. Having children makes this even more difficult. However, realise that this is part of the ‘joint wealth’ that you had in your marriage, which is now no longer in place. If you receive proceeds from the sale of the house, use them wisely, either as a deposit on a home of your own (or buy cash if you can), or as an investment in rental property. A client of mine received a cash settlement a few years back as part of her divorce settlement. It was not enough to buy the home she needed for herself and her two children, so she decided to rent a house – but she used the money as a healthy deposit to buy a smaller flat, which she rented out. Apart from the rental income she has received for that flat (which covered her costs), the property has accumulated handsomely in value and will be a valuable nest egg when she reaches retirement. Children are a major concern in a divorce. Avoid changing schools or cities if you can help it. This stressful time will just be made worse by uprooting everyone. Prevent yourself from burdening your children with too much unnecessary information. You may be tempted to confide in them, slate your ex-husband in anger in front of them, or even transfer your fears and insecurities about the future onto them. They don’t need to carry this burden. Seek support from your family and friends, and focus on being strong for your children and positive about the future. The least disruptive option for you and the children is to remain living in the family home after the divorce. If you own half the residential property (either because you were married in community of property or had an antenuptial contract with accrual), you may consider paying your spouse for his or her share and transferring the property into your name. You would need to take out a home loan for the amount, and have cash to pay the transfer fees for having his share transferred into your name. This will erode some of your wealth, but paying off your own home makes far better financial sense than paying rent to a landlord.